After the conclusion of the Me Made May Madness I feel as though I have a pile of projects I just want to dive into but I have once again been distracted! This time it’s by a quilting project – not for me but as a little gift for a lovely collegue about to go on maternity leave. I should also mention I decided to make this quilt only 2 weeks before I wanted to give it… Hmmm time for speedy sewing, so I picked a design that doesn’t have to be perfect (at least compared to normal extra-precise quilting designs) I’ve always wanted to try my hand at rag quilts in flannel fabric ever since I saw one at a craft fair years ago. 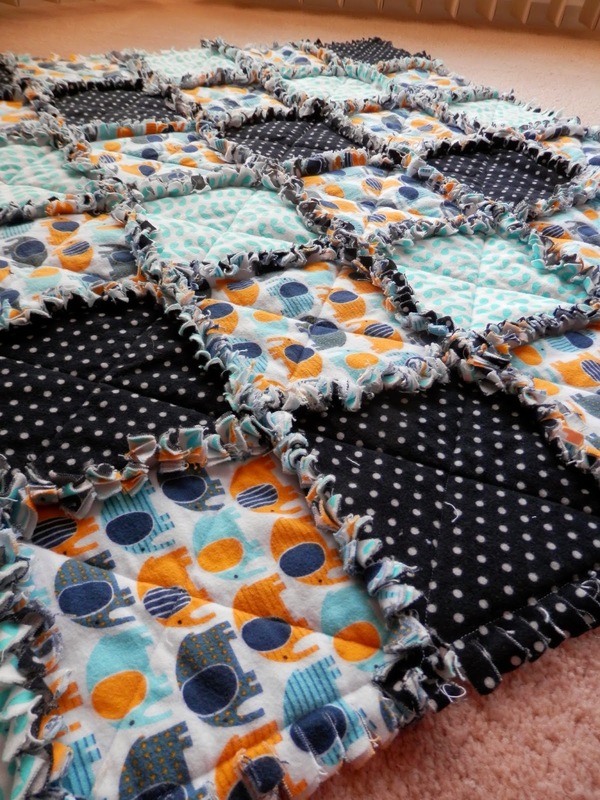 The flannel is so cuddley soft and the fluffy quilt edges give this type of quilt a more casual, almost shabby-chic appeal. How cute is this fabric??!! Bright Coloured Elephants! 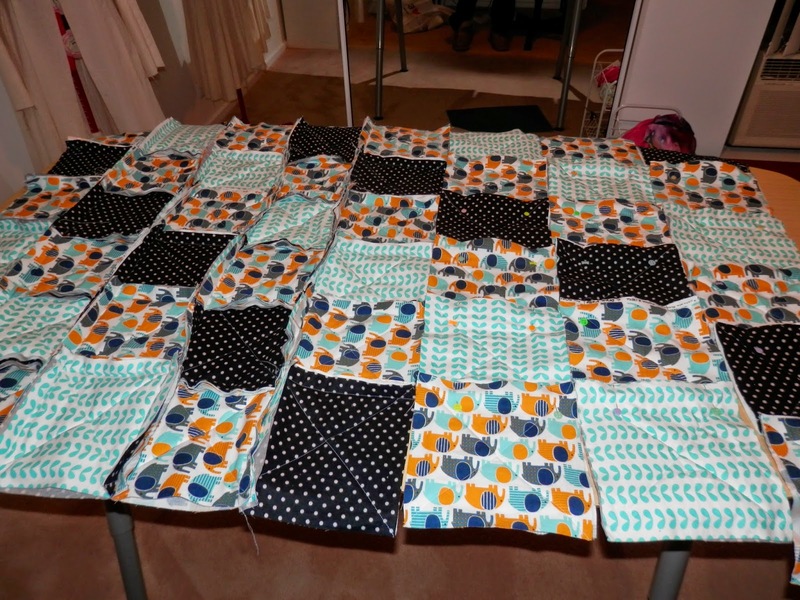 I used this tutorial and bought my fabric at Tricia’s Discount Fabric here in Adelaide. Tricia has a wonderful selection of quilters flannel and I was instantly drawn to these cute elephants! I picked out 2 supporting prints and bought some wool/poly batting as I like how puffy it looks when quilted plus I know it’s warm having used it in our bed quilt a few years ago. The staff at Tricia’s are fantastic and really know their stuff, if you’re in Adelaide it is a great place to shop. 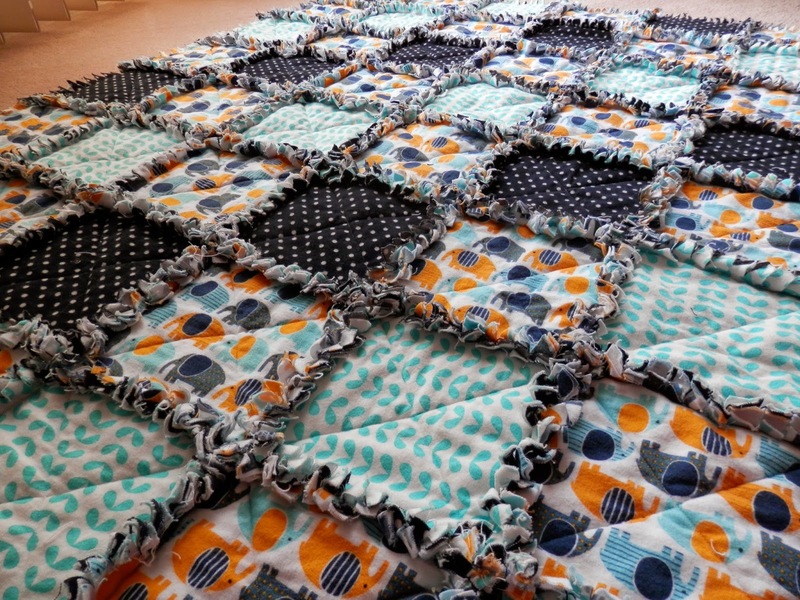 I actually was a good girl and pre-washed these fabrics on a cold machine wash so the finished quilt will be machine washable for all those baby messes! The final thing to do after trimming the seams is wash and dry the quilt in a dryer so the seams fluff-up into the rag finish. The actual construction went pretty quick – thanks mainly to Mum’s invaluable help folding and cutting the squares at the start. I finally learned to chain piece which helped speed things up. In the end this baby was done in about 10 hours! 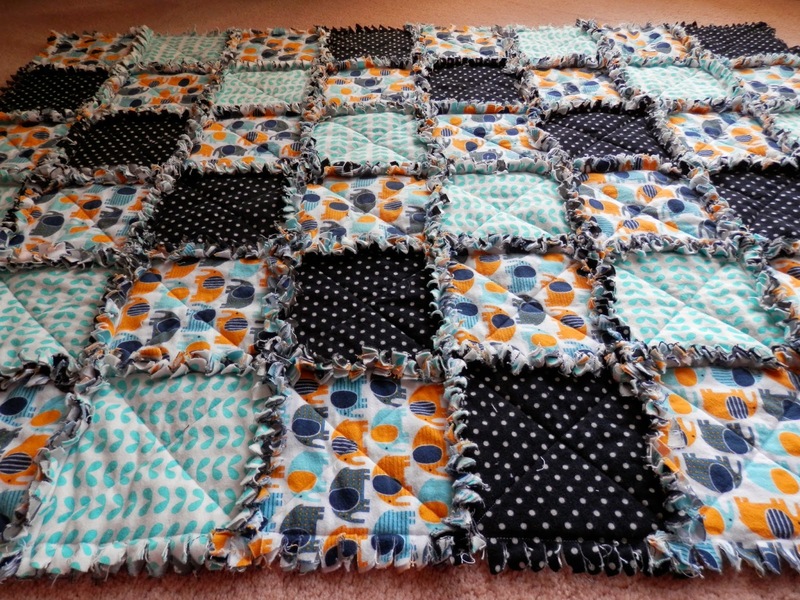 While the finish is not perfect – proper quilters would weep most likely – I really enjoyed this technique and would definitely consider making more of these quilts in the future. 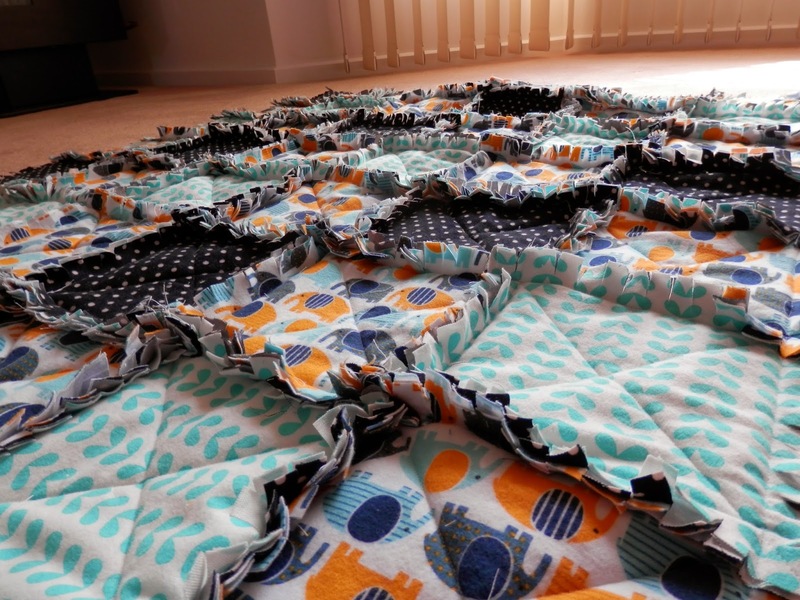 It’s quite big for a cot quilt, particularly compared to the normal cot panel size so it will be nice as a top layer in really cold weather or even as a play rug on the floor. You may also have noticed I have revamped the blog look a little – I’m still playing around with how I want it to look/feel so any feedback on what you like or don’t like will be welcomed! I really wanted to post this last weekend but I didn’t want to blow the surprise of this gift so I held off until now. I will be internet free for the next 2 weeks so sadly there will be no blog action until July now.